Wild Life Week is an initiative by Wild Life Federation to expose children to wonders of nature and wild life. It is celebrated in the first week of October every year by organizing some special activities connected with the wild life conservation. 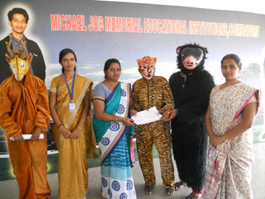 In connection with 'Wild Life Week' celebrations at MJC Dr.G.Nithya Organizing Secretary, Ms.Pratheeba and Ms.Bannari, Co-ordinators, Department of Zoology, Michael Job College of Arts and Science for Women organised various competitions like Drawing, Oratorical and Essay writing on 05.10.2015 and 06.10.2015 in our college premises. Around 25 students from various departments participated in the competitions. The essay writing and oratorical competitions were structured to encourage originality of thought of the students. The judges for the essay and oratorical competitions were Ms.Gokilavani and Ms.Suganthi. The drawing competition similarly brought out their creativity and demonstrated high level of awareness among the students. The title for drawing competition was “Wild Life”. 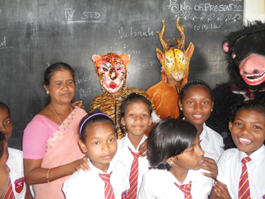 Dr.Vijayalakshmi judged the paintings of our students and kept their spirits high. 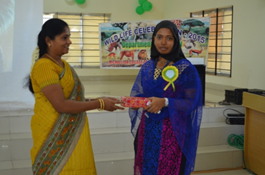 The valedictory function of “Wild Life Week” was celebrated on 07.10.2015 in our Seminar hall, IT building. 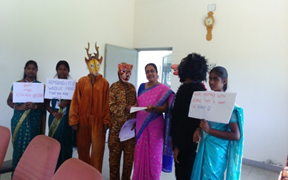 As a part of the function students of Zoology department enthusiastically participated and were dressed as animals who invited our guests by giving wild life awareness notices. The celebration was blessed with the presence of guests of honour Dr.N.Ezhilarasi, Asst.Professor, Govt.ArtsCollege, Coimbatore, Dr.D.Rajmohan, Asst.Professor, Kongunadu Arts and Science College,Coimbatore and Mr.Ramesh Arumugam, Secretary, GEM Trust as guest of honour Mr.Babu.P.Varu, Trustee and Dr.Lali Thomas, Principal MJCAS. 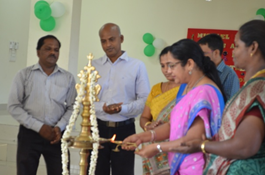 The celebration started with a prayer song followed by the lighting of the lamp by our trustee Mr.Babu.P.Varu, Dr.Lali Thomas, Principal, our Guests of Honour for the day and Vice Principal Ms.S.R.Dhanalakshmi. Welcome address was given by Ms.Soumia of I M.Sc Zoology. All the dignitaries on the dais were presented with mementos by our Zoology faculties. over the event and gave a lecture on the topic “WE AND WILD”. In his speech, he explained the importance of wildlife for healthy environment. By 11.30am our Guest of honour, Mr.Ramesh Arumugam, discussed about the environment and solid waste management. 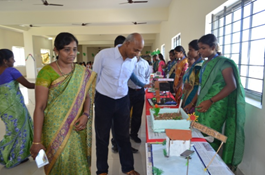 Our guests visited the models displayed by our Zoology department students. Around twenty five models were presented by the students and they explained in detail about their project to the guests and the visitors. 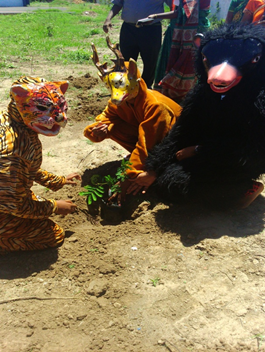 Their work exhibited their interest in conserving the biodiversity. bagged by Ms.C.Baghyalakshmi from IInd year B.Sc Zoology followed by Ms.M.Ramya from Ist year BA Tamil Literature. In the essay writing competition (English) first prize was won by Ms.Smyrna Karjee from IInd year BA English Literature and second prize by Ms.V.Gowri of II B.Sc Zoology. 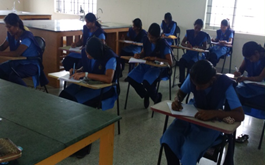 In the essay writing competition (Tamil) first prize was won by Ms.G.Nivetha of II nd year B.Sc Zoology. She was followed by S.Gayathri of IInd year B.Sc Zoology. 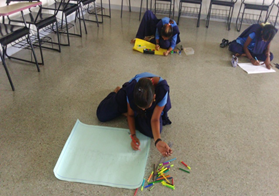 In drawing contest, Ms.K.Saranya of Ist year B.Com (CA) won the first prize and she was followed by Ms.Nilima Mukhiya of IInd year BA English literature. Ms.Gowri of IInd year B.Sc Zoology delivered the Vote of thanks. At last honorable guests planted trees in the college campus. 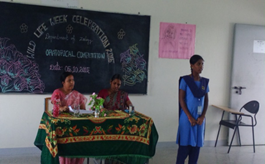 Ms.SaraJose, IIIrd year B.Sc Zoology and Ms.Sowmia, Ist year M.Sc Zoology were the master of ceremony. The function concluded with the National sAnthem. PROGRAMME ORGANIZED AND THE REPORT PREPARED BY Dr.G.NITHYA.